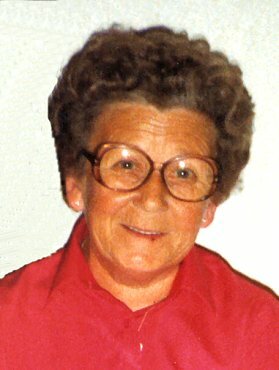 Eulogy by Rev Dave Whiteman at her funeral service in Maybole West Church on Thursday 21st April 2005. Betty was born Barbara Maria Robertson at Drumellan Street, Maybole almost 81 years ago. It’s fitting that we are here today because Betty was baptised in this very church by Mr Williamson. And Betty was very proud of the fact that it was her father who planted the trees around the church. Betty’s father was a forester from Aberdeenshire from Kincardine o’Neil and the family returned there when Betty was just a baby. Tragedy struck the family when Betty was about 5 years old when her father died. It cannot have been easy in those days bringing up a family. There was no income support in those days, and so Betty’s mum returned to Maybole to live with her mother. Betty was very bright at school, she had a good head for figures but at the age of 13 Betty got special dispensation to leave school and start work, and she got a job at Lees boot and shoe factory where she worked in the office. Betty worked for a while at the munitions factory, and for a while at Turnberry as an auxiliary. And a while at Monteforte’s cafe. Remember that and of course bringing up the family. Betty lived mainly in Maybole, apart from her time in Dailly and her 4 years in Scunthorpe, she stayed at Drumellan Street, at 1b Cairnfield Avenue now part of Glebe Crescent. At Kirkwynd and finally in 1972 moving to Abbot Street. The last 15 years of her working life was spent at Interpak, again in the office. Betty was a book keeper and she had a real head for figures. Betty retired from Interpak in 1984. What of Betty’s interests, well Betty loved the town twinning, and especially the friends that she made through that. She enjoyed going away with a group of people. Betty was one of the first to be involved and was at the signing ceremony in 1982. Betty had a flair for French and she enjoyed using her French when she visited. And Betty enjoyed going around the schools talking to the children about the twinning. Betty also enjoyed her annual trip to Benidorm with her friends from Interpak, we lost count of the number of trips Betty had with them. Betty enjoyed reading when she could, especially Mills and Boonand novels. Betty was a member of several organisations in the town, the Co-op Woman’s Guild, the OIR, the Trefoil Guild, the British Legion, and she joined the Eastern Star. Betty loved bingo down at the old bingo hall in Maybole, what used to be the cinema opposite the Grey Man. Betty especially loved dancing, what she described as proper dancing, old time, she loved the dances at the town hall tea dances. Betty was a lady who liked to be out and about, she was not one for sitting at home, she enjoyed going to her meetings at Crosne Street each week and she was a volunteer at Fairknowe which she enjoyed. And she loved being out sitting on the bench at Abbott Street with the Strachans and Mary, all together in the summer sunshine - happy days. Betty attended church regularly, when she was well enough, she was a regular for home communion, she got tapes of the church services each week and she enjoyed listening to them, and she was really very interested in all that was going on in the church. What of Betty’s character? Well, Betty spoke her mind, she was a strong person by nature, I suppose that came from the times she lived through and she had a strong will, she was a determined person, when she set her mind to something that was it. She was so full of life. And she had a great sense of humour,. Betty was fiercely independent and she took it hard when she lost that independence. Betty was, of course, on oxygen for the last few years of her life and her breathing was difficult. Betty really thought the world of her carers, she could not speak highly enough of them. And she just loved Ainslie Manor in Girvan, she was really happy there really content, the staff were just wonderful to her and to the family. The care Betty got was first class and the family are very grateful to the staff for their dedication to Betty. Usually in my first prayer I mention the whole family by name, but well if I had tried to mention everyone in the family we would have been here all day! Betty’s legacy is her family, I know she loved you all very much indeed. Perhaps we can gain some comfort from the fact that Betty fell asleep, she slept away peacefully into eternity with great dignity - and that is what she would have wanted.